I don’t know anyone who’s ever seen a unicorn, the end of a rainbow, and most don’t believe in magic. 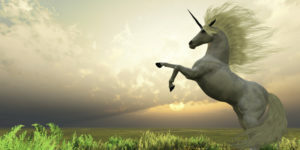 These phenomena conjure up the words “myth,” “surreal,” and even “impractical.“ But my unshakeable belief in unicorns has helped me overcome insurmountable challenges. Before you write me off, do read on. Since childhood, I’ve believed in things I cannot see. I believe that we are born pure spirit energy and then we become so immersed in our human being-ness, we forget that we are from God, and take on ideas that limit us. As an entrepreneur, daily, I am confronted with choices — to follow the rainbow or be practical; to chase the unicorn or settle for the bird in the hand; to pursue that desire to make magic, or stick with the status quo; to give up... or believe. I studied several successful entrepreneurs and two things they all have in common are — 1) they’re empathic, and 2) they have a drive to manifest that “unicorn” of an idea no one has before, or that others don’t have the chutzpah to pursue. Therein lies the gifts: heart. and the spark of ingenuity, otherwise known as the belief in unicorns, rainbows and miracles. I spotlight three stories below. She believed in Unicorns. Mali Phonpadith is an entrepreneur, author, speaker, with 19 years experience; producer of Tea with Mali TV and Host of SOAR Community Network Podcast. As the CEO of SOAR Community Network (SCN), she offers businesses marketing and IT consultation, and develops legacy-driven leaders. Mali’s family escaped from Laos, in a boat, across the Mekong River, when she was four years old, seeking safety at the shores of a Thai refugee camp. Today, Mali’s belief in unicorns — the unseen gifts in others — is her business model — she helps others discover their unique gifts, uncover their brilliance and share them with the world. On May 6th, she hosts the inaugural SOAR Community Summit, where more than 50 national experts will share insights on legacy driven leadership. She Believed in Magic. Dr. Jennifer Sims has more than 13 years experience as a chiropractor, and is the mother of two boys. She channeled lessons learned from personal challenges into Blue Sky Health and Wellness, where she incorporates emotional and physical healing. Her determination and belief in miracles, have made her a sought after physician. Her business model was built on her unique view of the future of holistic health — one that incorporates empathy and love, not just spreadsheets and business plans. This unconventional way of thinking, sprinkled with fairy dust, magic and miracles drives her success. Marissa, Mali and Jennifer are real women with goals, dreams and challenges. Experts can teach you how to write, market, network, but it’s remarkable when you meet entrepreneurs driven by faith in the impossible (the rainbow), the desire to find something that doesn’t exist (the unicorn) and who conjure up miracles (the magic). Some might wonder about the practicality of building a business centered around such esoteric beliefs. As entrepreneurs, we focus on the bottom line, value, quality, superior products, expertise, board approvals and endorsements from peers. Really, how mainstream is the idea of launching an innovative zinger of a business, built on empathy, magic, unicorns and rainbows? The thing is, global consciousness is shifting towards breakthrough ways of doing business. I spoke with entrepreneur, Laura Hollick, who built a six-figure business based on our most fundamental human need — love. Having a child-like belief in creating solutions that don’t exist is what drives me. I chase unicorns everyday - I will create the thing that doesn’t exist. As a new entrepreneur, every time I wanted to quit, I believed that at the end of the storm was a rainbow. I believed in miracles when unsure that a risk would bring the best returns. It is exciting to know this “revolutionary” yet simple way of building a business can bring such reward — spiritually and professionally. When our work brings us joy, we unlock unlimited potential, which translates into creativity, innovation, and profitable brands. So, go ahead — chase the unicorn, find the rainbow, make magic and rock on! Having a child-like belief in creating solutions that don’t exist is what drives me. I chase unicorns everyday – I will create the thing that doesn’t exist. As a new entrepreneur, every time I wanted to quit, I believed that at the end of the storm was a rainbow. I believed in miracles when unsure that a risk would bring the best returns.